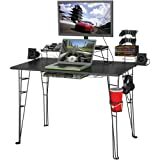 There are a huge variety of computer desks available, and the best computer desk review gets you familiar with some of the finest qualities from each one. Making a smart desk purchase means taking the time to obtain measurements and trying a variety of styles out for comfort. The most appropriate purchase is made only after considering your own style, the size of your work space and your comfort. 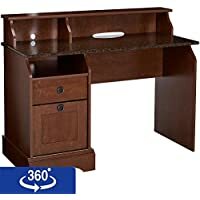 Selecting the best computer desk for you means finding something that you are comfortable spending hours in because it’s both beautiful and designed to fit your body. Thirty inches is the standard height measurement for most desks, but you can purchase a desk that features adjustable legs so that the height is custom to your body. Extremely short, tall or people who just need a little extra leg room should consider adaptable legs. Just like their height, desks are offered in a multitude of different shapes and sizes, too. Some desks are built for comfort; others are designed to provide a sleek look, portability or functional storage space. 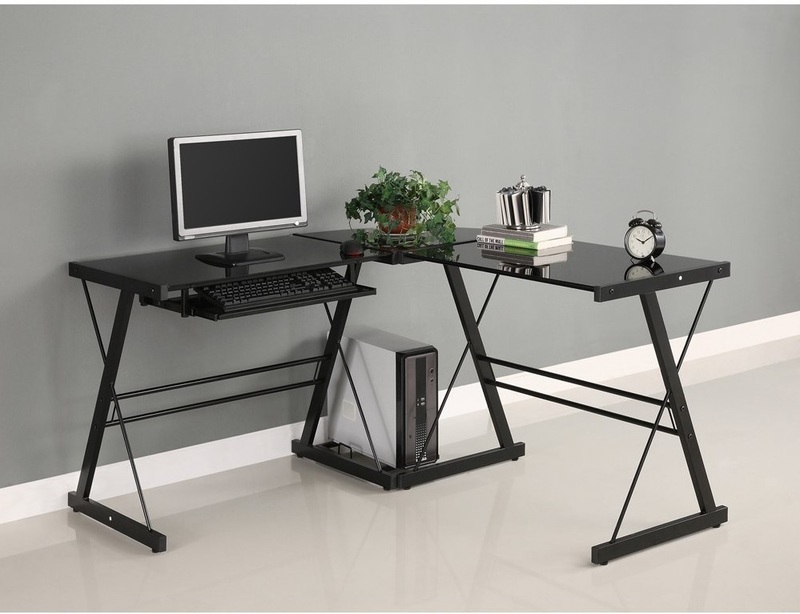 The best computer desk has an ergonomic design that fits your body and your space. If you plan to spend hours behind your computer, an ergonomic desk is vital for your body’s overall health and comfort. Note: Product images, dimensions, weight, build materials, and price are obtained via Amazon.com. When picking the right desk, it is vital to consider your space, your body and what purpose the desk is serving. For instance, the best computer desk for gaming and the best computer desk for work are going to be very different. 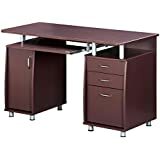 A gaming computer desk might have enough space to house multiple monitors; whereas a desk for work might feature a number of cubbies for storing your supplies or paperwork. Before taking the plunge and opening your wallet, consider your work space. Some factors that are important to think about are your work area and the desk’s material, design, storage, comfort and portability. Each factor plays a significant role into whether or not a desk is going to satisfy all of your needs. The size of the room and how it is laid out (windows, vents, closets, doors, etc.) are important factors to consider when selecting a design. For instance, if your room is smaller, perhaps you will want to select a desk that is floating or L-shaped. They take up the least amount of space, and some are even small enough to be mounted in a hallway. It’s also a good idea to purchase something that is versatile enough to fit in other rooms. Perhaps, your office is huge, but you are considering turning it into a nursery. You’ll want to go with a smaller desk so that it will fit neatly someplace else, too. Desks can be crafted from all types of materials, but some of the most common are laminate, metal, glass and wood. The material doesn’t change the overall function of the desk, but it does contribute to its durability. Desks can get extremely expensive, but buying something that is cheaper (laminate that isn’t high-pressure) often means it isn’t as sturdy. Bite the bullet and spend the extra money now to get something you know will last. 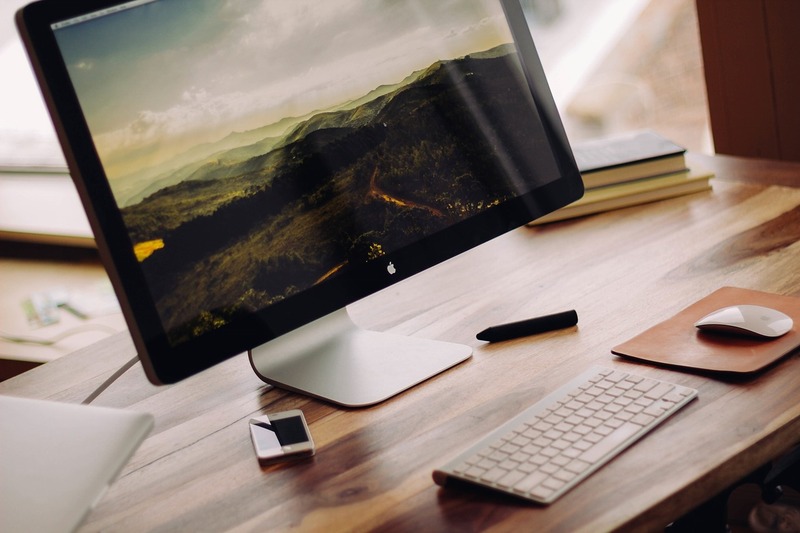 Buying a desk that is lower quality will end up costing you more money in the long run because you’ll have to replace it more frequently. Laminate is a popular, cheaper option, but only purchase a high-pressure laminate desk. They tend to be sturdier. They look sleek, but like any other glass product, it can break with excess force. Also, you’ll be able to see every smudge. A wooden computer desk is beautiful and traditional, but wood is often more expensive and will nick easily. You’ll get the most bang for your buck if you select a metal desk. It is durable and it won’t need much upkeep. As mentioned above, there are many options in terms of design. Each type has its merits, but it’s best to purchase a design that works well with your layout. Corner desk – Since this style fits snuggly in a corner, it saves space. This means you’ll likely have your back to the door. Privacy could become an issue. L-shaped desk – These desks provide a lot of room for big projects, and they’re also space-saving. However, they aren’t quite as versatile. U-shaped – Like the L-shape design, the U-shaped desk offers a ton of room for work, but they take up quite a bit of floor space, too. Rectangular desk – A traditional desk doesn’t offer a ton of room, but they will work in about any space. You can place them against a wall or right in the middle of the floor. Storage capacity is selected based solely on your needs, but we would suggest holes for cords and a few drawers to store general supplies. Again, your comfort is unique to you. 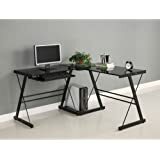 Selecting a desk that has adjustable legs will help if you are very tall or short, but you must try a desk out to make the smartest choice for ergonomics and comfort. Portability is probably something you’d appreciate if you have a baby in the house, or if you work away from home often. A portable desk isn’t necessary for everyone, but if one of the two circumstances above applies, considers a desk that’s lightweight with wheels. The Good: This floating desk is an excellent space-saver. The Bad: Extra large monitors will not fit in the center cutout. The Prepac floating desk allows you to have all the luxuries of any standing desk without sacrificing money or floor space. 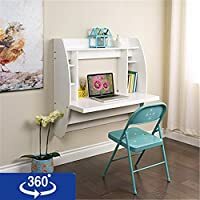 This desk can be mounted in any room and has a $150 value. It comes with a metal hanging rail system as well as a five-year limited warranty. Crafted from high-pressure laminate wood, its side compartments have three removable shelves for easy storage. It also has a top shelve that can be used to display pictures or books. The desk features cable and wire management for easy organization as well. The Good: You can receive free replacement parts for this product. The Bad: The desk’s rectangular design offers minimal workspace. 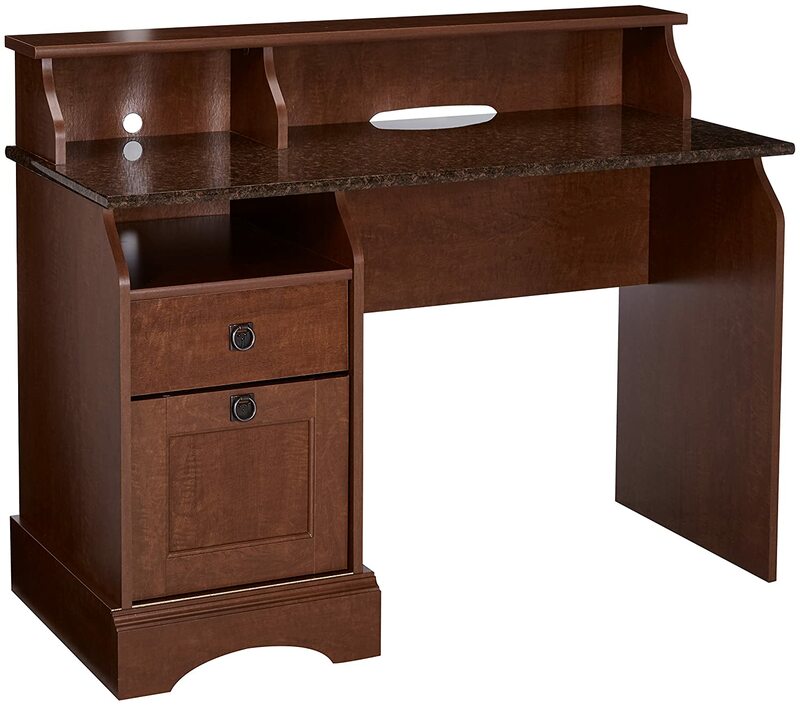 The Graham Hill Desk’s faux granite top design is attractive and functional. 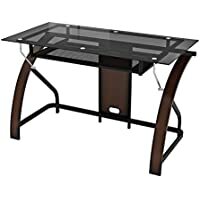 This added luxury does not add weight (the desk is approximately 95 pounds). The granite top is also protected with a finished that is heat, stain and scratch resistant, which makes it the perfect place to sip your morning coffee. You can expect to pay a moderate $170 to take this piece home. Its two drawers (the bottom will hold letter-sized files) have a patented T-lock assembly system. The desk also features a top shelf for extra storage or to display books or photographs. 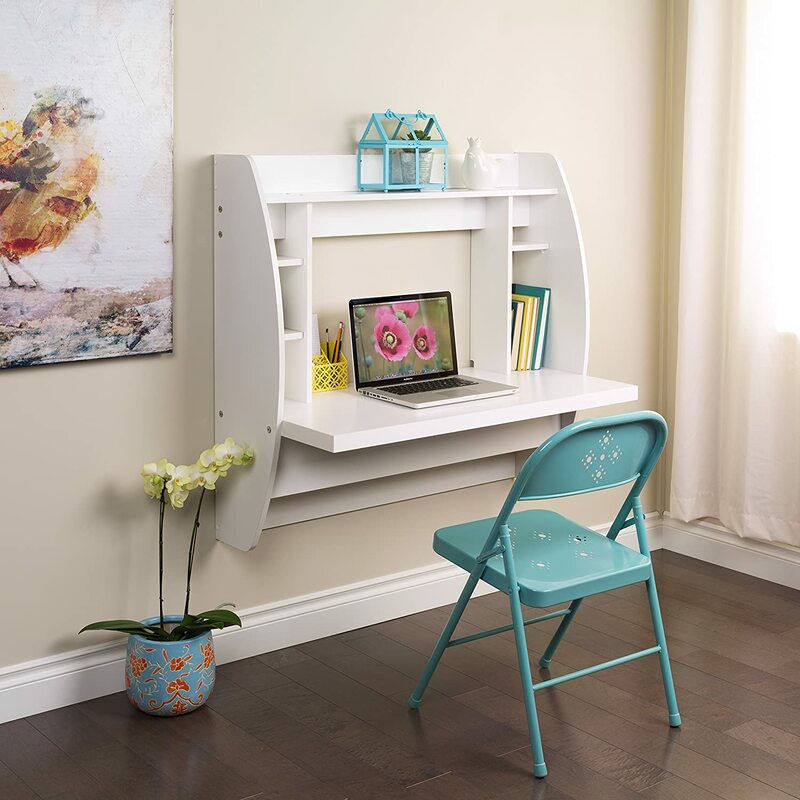 Its cubbyhole is the perfect place to hide paperwork, books or general clutter. The Good: This desk has a modern, clean and sleek design. The Bad: The Z-Line Claremont Desk has minimal workspace. 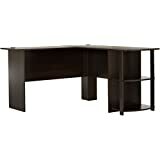 This desk features real wood veneer that has a mocha finish. The desktop is made from 6 millimeter thick tempered safety glass, and it offers chrome cylinder glass as support. The smoked glass provides a modern, sleek appearance, but you’ll need to clean it frequently because of smudges. 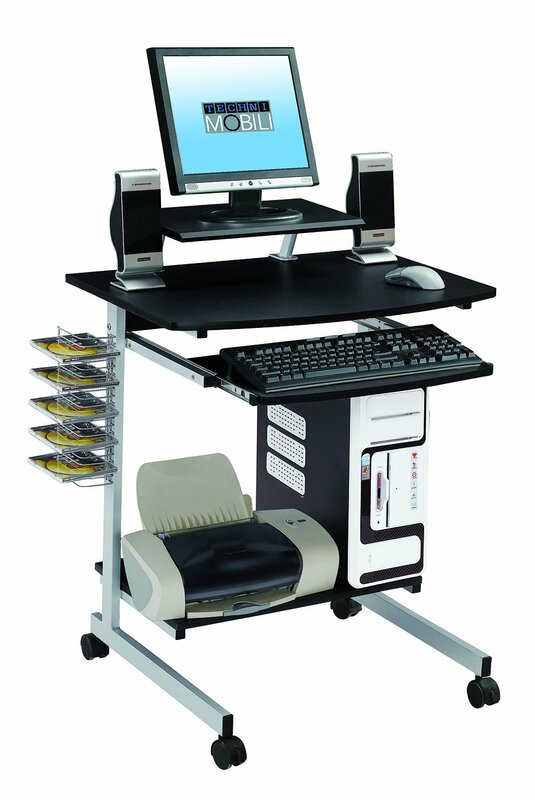 The Z-line Claremont desk also provides a full pullout keyboard tray that can also hold a mouse. This is a rectangular desk that looks beautiful, but offers minimal work space. The price tag is approximately $142. The Good: This desk is mobile. The Bad: The Techni Mobili computer cart has minimal storage space. 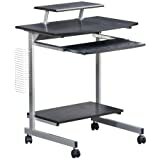 Considering you are getting a mobile computer cart that holds CDs, offers a pullout mouse tray, wheels, an accessory shelf and adjustable printer shelf for less than $100, you’re getting quite the deal. Perhaps, this design isn’t as sleek or attractive as the others mentioned above, but there is something to be said about its mobility. The Good: The Walker Edison desk has plenty of workspace. The Bad: This desk offers no drawers or features for storage. The Walker Edison’s modern design is made completely of thick glass and durable steel. 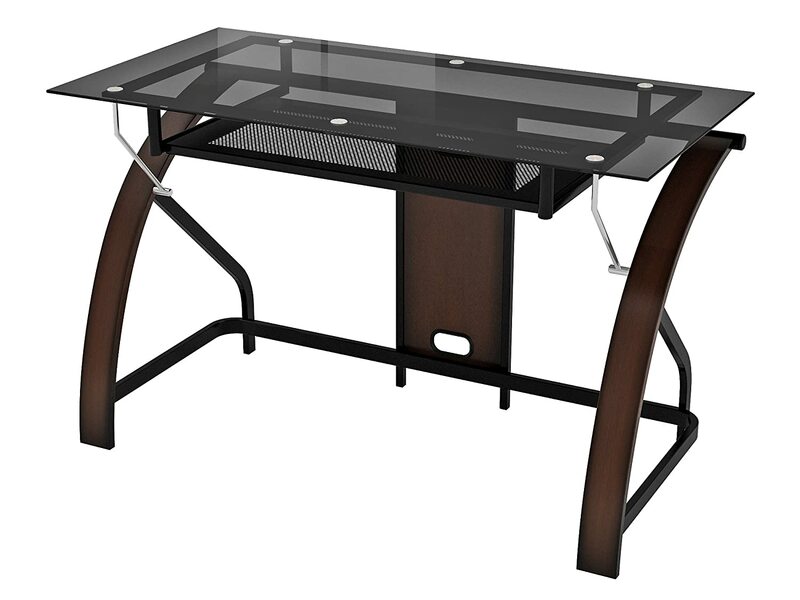 The desktop’s tempered safety glass is polished and beveled, and its frame is made of steel with a powder coated finish. The desk offers a sliding keyboard tray for convenience that can be mounted on either side of the desk. In stark contrast to the other desks mentioned above, this L-shaped design supplies much more workspace. It offers a CPU stand and comes with step-by-step instructions. It taps in at approximately $105 dollars.